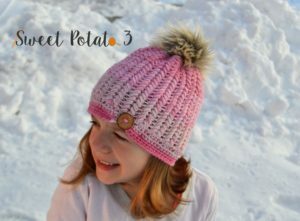 I am so excited about my newest hat pattern release, the Snow Drifter Hat. The beautiful, fun and unique texture of this hat is very eye catching. 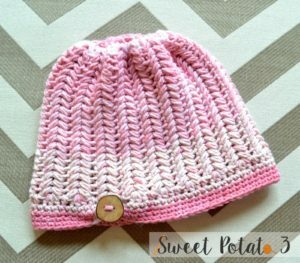 A simple little pinch pleat on the brim of the hat is a cute touch of charm to the hat. 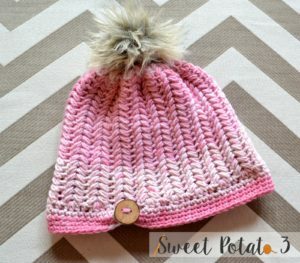 The puff stitches that weave together create an appealing texture that you will enjoy creating as you crochet this hat that is perfect for a day in the snow. Find more details about materials used to make the Snow Drifter hat in the listings. Enjoy making it with or without the pom. 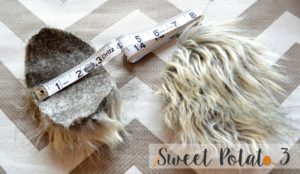 If you like the faux fur pom, see the tutorial below on how to make your own. A couple weeks ago I ordered a couple online to add to a new hat design. I was so excited to receive them only to open the package and see that they were twice the size I was hoping for. 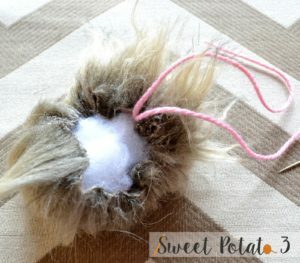 A few of my wonderful fans on facebook had mentioned that they made their poms. So, I started to research how to make them. WOW… It is so easy! I quickly made a new one and wanted to share with all of you how easy this really is. You can buy the faux fur at most crafts stores. 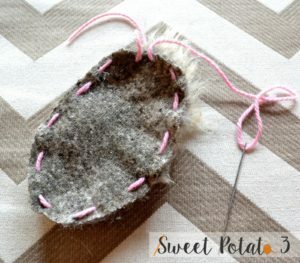 Cut the fur into an oval about 3″ X 4″. You may have to pull the loose fur off the edges. Doing this now will make the pom cleaner and shed free when you are done. Using a tapestry/yarn needle thread around the pom. These stitches do not need to be exact or uniform, they will be completely hidden when you are done. 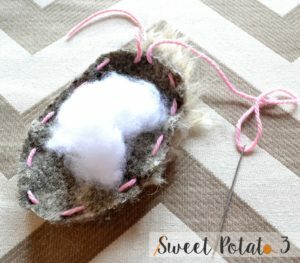 Add a small ball of fiber fill to the center of the oval. Tie ends of yarn together and pull tight. Continue to pull, making sure the fiber fill is all enclosed inside the pom. Once the pom is completely closed, tie another knot to secure. Just like that you are done. 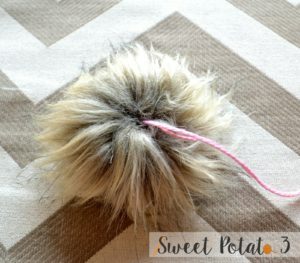 Use the yarn ends to attach the pom to a hat or other fun accessory. Tada, so cute!!! This is the new Snow Drifter Hat design that I knew I wanted a faux fur pom on. Isn’t it fabulous!